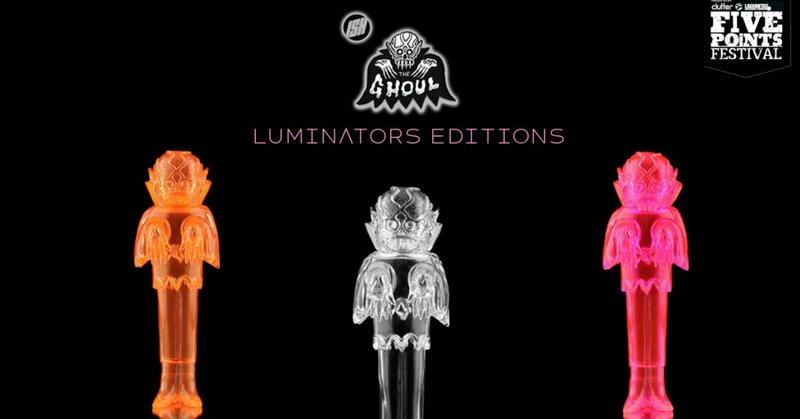 We don’t know about you, but we can’t get enough of Justin Ishmael & Craig Gleason “THE GHOUL” and yesterdays newsletter from Justin confirmed we “CLEARLY” *nudge, nudge wink wink* need these all-new THE GHOUL LUMINATORS versions of THE GHOUL. Lucky sods who are heading to Five Points Festival will be able to pick up these beauties as Justin will be exhibiting at Five Points Festival next week. Like we’ve said on many occasions, we can’t argue these colourways suit THE GHOUL and no doubt THE GHOUL by Craig Gleason x Justin Ishmael produced in Japanese Vinyl by Grody Shogun/ Luke Rook was one of the highlights of 2017 and we predict 2018 will be the same. Grab some toys! I’ll have exclusives and hand-painted versions of my own and other artist’s toy, as well as sneak, peeks at upcoming releases. Brooklyn, NY at the Brooklyn Expo Center! Come see me at Booth #337 on June 2-3 .